A lot of attention has been given (and rightfully so) to the spectacular Double Cluster, which is a pair of nice open clusters. There aren't too many samples of double globulars (now wouldn't that make a nice pairing! 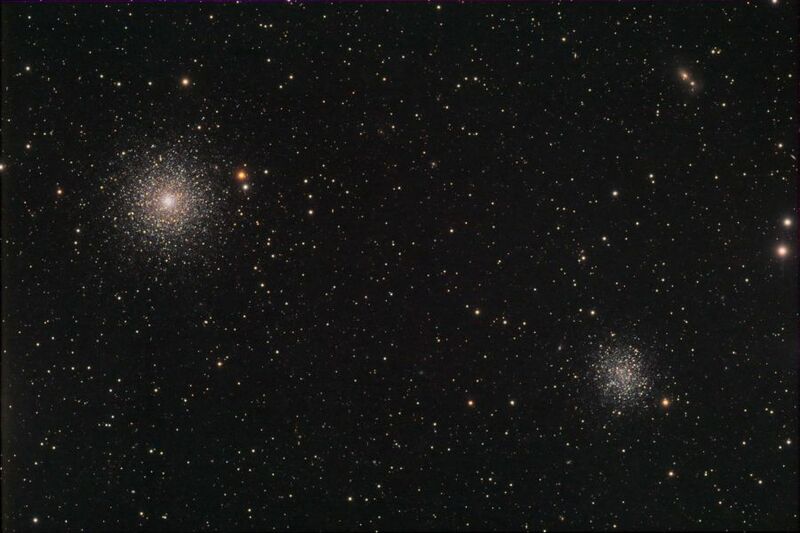 ), i.e., globular clusters within a medium to wide field of view. I did find this pair, however. M53 lies about 58,000 light-years from our Solar System. Like most other globular clusters, it orbits the Milky Way a great distance from the galactic plane, in this case about 60,000 light-years from our galaxy's core. Given that great distance, it is less spectacular through an eyepiece than the grand master of the Northern Hemisphere, M13. From our vantage point, it is 13 arc-minutes in diameter, which is a little less than half the width of the Full Moon. Given the distances involved, this makes M53 about 220 light-years wide. Not bad for something that looks so small! NGC 5053, the second of the two globular clusters in this shot, is about 1 degree (2 Moon Widths) southeast of M53. It is about 53,500 light-years away from us, which puts it physically close (relatively speaking!) to M53. If these two were as close to us as the Double Cluster (7,000 light-years), the view would be awesome! NGC 5053's apparent diameter is 10.5 arc-minutes, which makes it a still impressive 160 light-years across. It is sparsely populated for a globular cluster, which made a lot of astronomers doubt its nature as a globular for a long time. Some declared it a dense open cluster, until recent spectroscopic analysis firmly classified it as a globular, based on the age and chemical composition of its stars. A lot of faint galaxies are visible in the larger image. Feel free to look around. The most obvious one is IC 1858, close to the upper right-hand corner of this image. Equipment Used: Takahashi TOA-130F with flattener on an Astro-Physics 1200GTO mount. SBIG STL-6303 camera with STL-FW8 filter wheel and Astrodon LRGB filters. Self-guided using the STL-6303's built-in guide chip, positioned via an Astrodon Takometer camera rotator.